Spray 12-inch skillet with cooking spray; heat over medium heat. Add asparagus, onions and 1 cup of the broth; cook 5 to 7 minutes, stirring occasionally, until liquid has evaporated; remove mixture from skillet. Add beef to skillet; cook about 2 minutes over medium heat, stirring frequently, until beef is no longer pink. Return asparagus mixture to skillet. Stir in remaining broth and remaining ingredients except cheese. Cook about 2 minutes, stirring frequently, until mixture is hot. Sprinkle with cheese. Look for miniature bow-tie pasta—or tripolini—and use instead of the regular bow-ties. Add fresh basil sprigs and a Parmesan cheese curl to make the dish even more elegant! 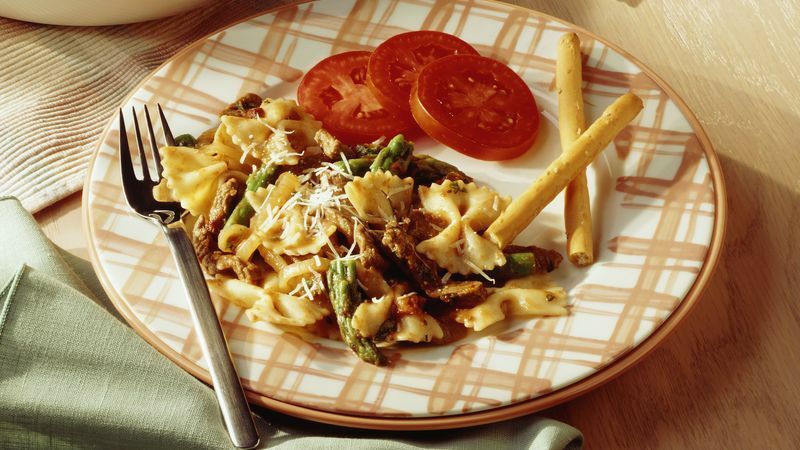 Replace the Parmesan cheese with crumbled feta, toss in 1/4 cup capers and you’ve made Beef with Bow-Tie Pasta à la Greece.